In the early morning we set sail for the village of Sagaing to visit the impressive Soon U Ponnya Shin Pagoda. Once we reached the village of Sagaing, the surrounding hillsides were covered in temples of all sorts. Some painted white and others covered in gold leaf, some in bell shapes and yet others cone shaped. It was explained to us that this area is well known for its number of nunneries and monasteries (also known as the Buddhist Vatican). They believe that more than 6,000 monks and nuns live in these residences. The area is not only a place of pilgrimage but also a place where Buddhists come to learn to meditate. We took busses to Sagaing hill where we transferred to local pick-up trucks fitted with a covered truck bed with a bench on either side. These popular forms of local transportation were small enough to transport us up the steep winding streets to the Soon U Ponnya Sin Pagoda. Once at the pagoda we removed our shoes and socks before entering. 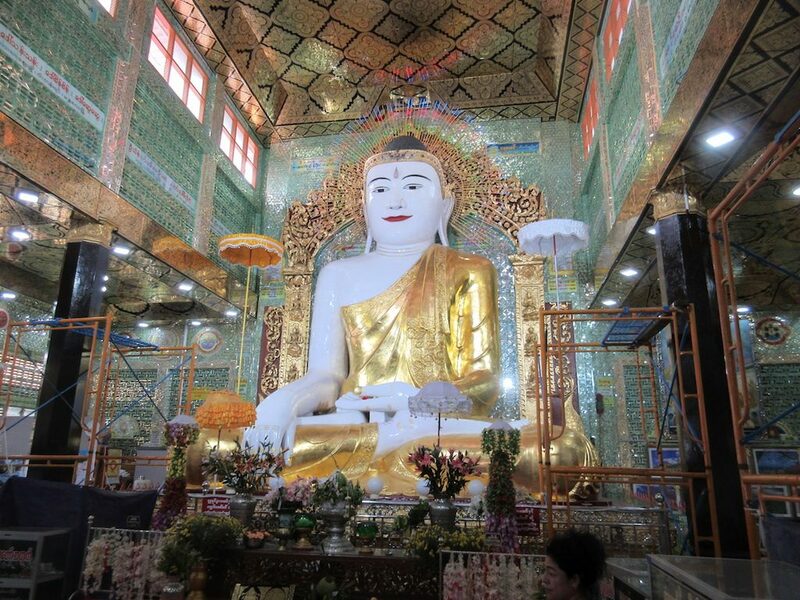 Once inside the first thing that you see is an enormous depiction of Buddha in beautiful white and dressed in a gold sarong and it must be at least 30-feet tall. 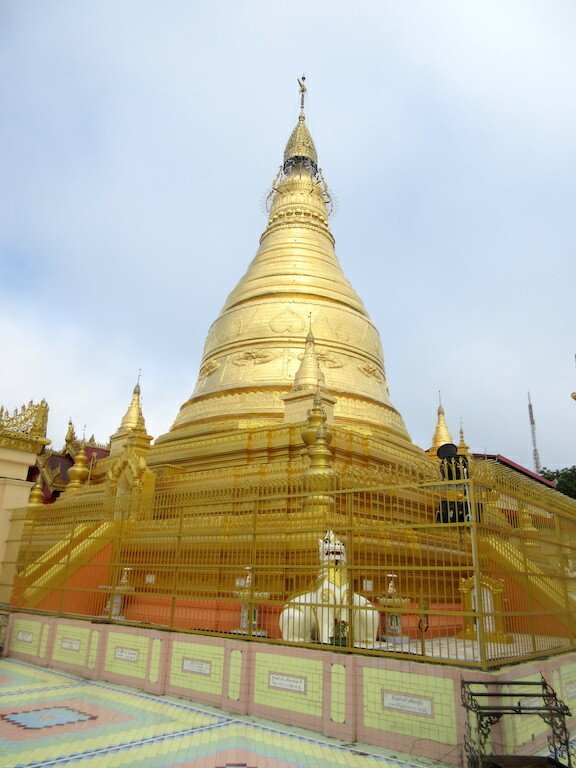 The complex of the Pagoda also has a large gold Stupa which is a solid pagoda with no access to enter it. 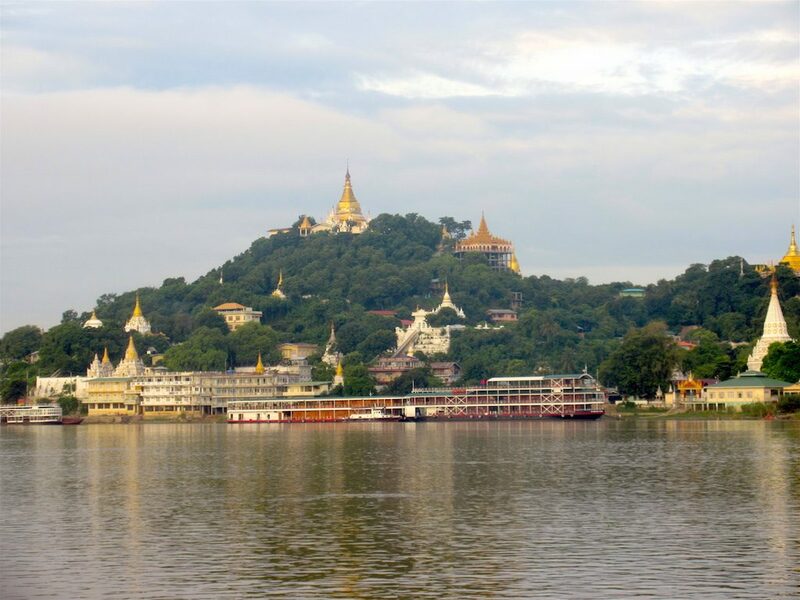 The views from the hillside are spectacular looking over the Irrawaddy river and the neighboring hillsides covered in lush green vegetation and dotted with many pagodas. The grounds comprise many outdoor courtyards tiled in colorful ceramic tiles and many surrounding structures each elaborately decorated with mosaics of mirrors and housing a variety of different sized Buddhas. Next we took the pick-up truck transportation to the Thankyadita nunnery where we visited with about ten of the nuns who live there. This particular nunnery houses about 120 nuns aging form nine years old to 88 years in age. The head nun has been a nun here for 45 years, arriving when she was just ten-years-old. The nuns all wear pink sarongs over red skirts making them very recognizable throughout the country. They rise at 3:30 in the morning and study and pray until 10:00 at night. From the nunnery we visited a local silversmith shop as this is also an area known for its silversmiths. Behind the showroom was a simple outdoor silversmith shop where several men worked on a variety of silver vases, a silver purse and a bowl. 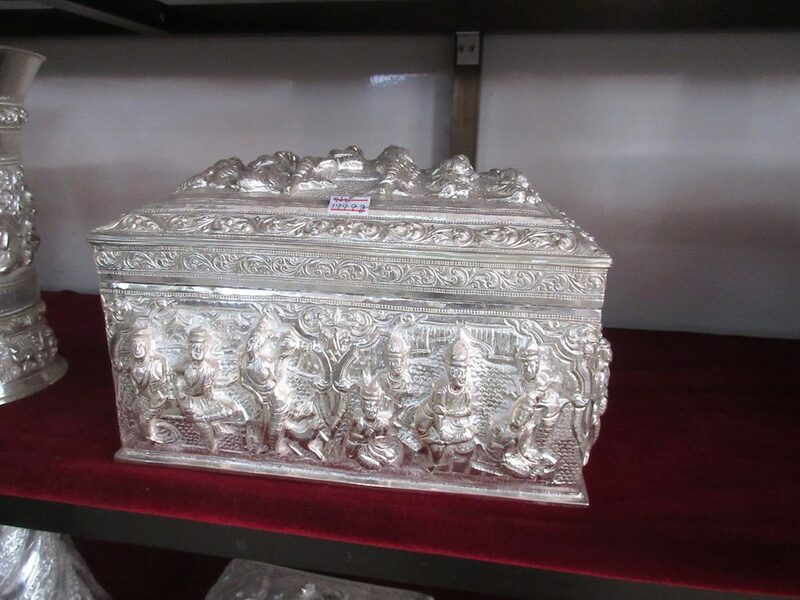 The silver goods were mostly thin walled, but ornately decorated with a variety of animals and geometric designs. Next we visited the ancient capital of Ava located a short drive across the river from Sagaing. The Ava Kingdom was the dominant kingdom that ruled upper Burma from 1364 to 1555. The town of Ava is very rural in nature and the roads are extremely narrow and covered by trees. Since it was not possible for the buses to transit these small streets we were transported around the town on horse carts. These wooden carts have large wooden wheels about five feet in diameter, a covered passenger cart capable of carrying the driver and two others. As soon as we disembarked our bus and boarded the horse carts, we were surrounded by locals, mostly young ladies selling jade, chimes and other local items. Once we had boarded the carts and began down the street, the young ladies got on bicycles and followed the carts continuing the sales pitch during the entire ride. At one point Kent began to answer the young lady in Spanish and she began to speak back to him in Spanish. They see so many tourists that they pick up a variety of languages to better interact with the visitors and sell them their goods. At Ava we visited the 200-year-old teak Bagaya Kyaung monastery originally built in 1593, but destroyed by fire in 1821. In 1992 the government rebuilt the brick building on the site of the old monastery from a model of the old monastery. The monastery has seven tiers built with 267 teak wooden posts and stands 188 feet tall and 103 feet wide. 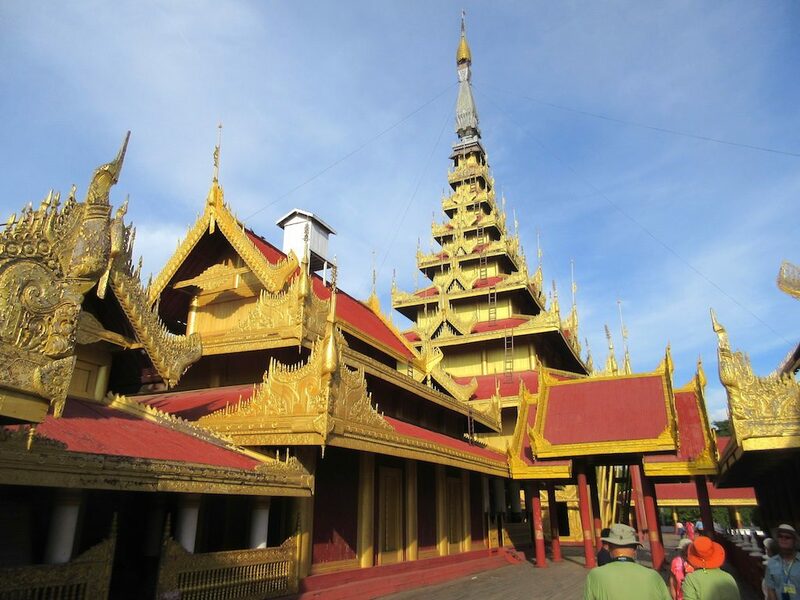 The structure is decorated with Burmese wood carvings of birds and animals as well as small pillars decorating the walls. The monastery being made of wood and having no air conditioning was extremely hot and was very dark inside. There were no lights and no windows, only a few small doors that provided light into the wooden structure. From the monastery we were taken to a dock where our ship the Irrawaddy Explorer was waiting for us. After a late lunch we were shown a BBC documentary on the life of Buddha to give us a better understanding of who the Buddha was. Buddha is believed to have been born along the northern border of India in Nepal. They say that he came from a very wealthy family and spent his entire 88 years understanding life, meditating and learning a new sense of consciousness. Once he came to understand these things, he spent his life training others.